just let me submit something! – Click the Register Button. – Check your email for something from WordPress. The subject will be “[AWMOK Kitschenette] Verify Your Account”. Click the link in the email to verify & activate your account. – Log in with your Username and the Password in the email. If you’re submitting multiple items, EACH ITEM MUST BE SUBMITTED SEPARATELY. This is not to be confused with submitting multiple photos for the same item. This only applies if you are submitting multiple items, in which case you need a separate submission for each separate item. Submit for review. Once you’re finished preparing your submission, your submission will be reviewed and considered for inclusion in the Kitschenette. 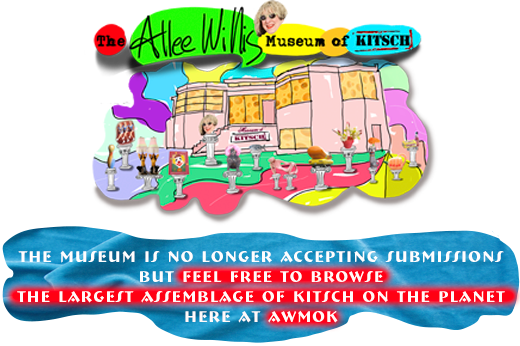 I will also consider awarding it a Certifikitsch Of Authenkitschity, which means the Certifikitsch will be stamped on your page and the object you submitted will become part of the museum’s permanent collection at awmok.com. I personally approve all submissions. Usually your submission will show up within 24 to 48 hours. In addition, if I see something that’s so spectacular I can’t stand it I will award it a Certifikitsch Of Authenkitschity, which means the Certifikitsch will be stamped on your page and the object you submitted will become part of the museum’s permanent collection at awmok.com. – Log in to your WordPress Administration Panel. – Click the Posts tab. – Hit the “Submit for Review” button. PLEASE NOTE: ONCE YOU HIT ‘SUBMIT’ YOU WILL NOT BE ABLE TO SEE OR CHANGE YOUR POST UNTIL ALLEE PUBLISHES IT. Photos can jpegs, gifs or PNGS. Maximum image size is 550 width, 72 dpi. Any images exceeding these dimensions will automatically be resized. The first photo you upload will automatically be chosen as the thumbnail of your submission so choose carefully! You can upload more than one photo. The first photo will be at the top of your description. The rest, if any, will appear under it. – In the Upload/Insert section click on the Add An Image icon. – Click Choose File to select an image from your computer. – Click Upload to upload the image. – Click the Insert into Post button. Again, you must have an account to post comments, so go to “Register For An Account” if you ain’t already in the house. All comments are reviewed prior to publishing and, unless your entry is completely offensive or inappropriate, will appear on the site as fast as my brain can move. – Enter your comment directly into the “Leave a Reply” textbox under each post.